I’m writing this article as an explanation on why I’m so inactive this month, and why there is so little bookish content on my blog recently (although my last article is a book review). The main reason is, I’ve been super busy, obviously. And since I haven’t done a proper life update post in a while, I decided I might as well do one now, since lots of things have been happening! As some of you may know, I have been living in Berlin since the end of September. Moving here was a crazy adventure, I had to move dorms in the middle of the year, I had to struggle with German, I met so many amazing people, I got to travel… But more importantly, and something I absolutely did not expect, I found a place where I belong. Sadly, this amazing year is coming to an end, and I am going back to France of Tuesday. I still cannot believe it. I have been super busy since the beginning of July, because first, two of my friends visited me, and it was amazing. Then, I had to move out of my dorm in the middle of exams. I am now staying in a friend’s room in my previous dorm, because my contract ended one week before the end of the exams. I am not going to discuss this matter further, but if you want to read my live-tweet of this adventure (yes I do that) you can read it here. I can’t believe it’s been a week already. On top of that, I had exams, so not much time to read or blog. I have also been struggling a lot with mental illness recently. There are ups and downs, obviously. But I have been feeling better this past few weeks. I have met some amazing people throughout this year. I am finally making projects for the future, and by that I mean projects that are getting me super excited, projects where I can actually see myself. Things are starting to make sense. And it’s getting me super excited. Of course, there are still tons of things unanswered. But I have things to look forward too. And after wondering about it forever, I decided to get a tattoo, which is also something that I am super excited about. I’ve had it for about a month now, but I don’t think I have mentioned it here, so here we go! And one more thing I wanted to mention because it also got me really excited. On Saturday I attended Christopher Street Day, also known as the Berlin Pride Parade. It was my first time attending Pride, and it was an amazing experience. Unfortunately we got caught in a massive storm – I honestly have never been so soaked in my entire life – but it didn’t matter. It was so heartwarming. A beautiful, amazing experience. Bonus: my friend nudging me and telling me “that’s your people! !” when a group of people walked by with a bisexual pride flag. And I have to admit, it was so comforting and beautiful and welcoming. Hard to describe. But it felt good and I’m so glad I went. It didn’t even matter that there was a huge crowd, and I will definitely do it again. I guess that’s it for today. Bits and pieces of what has been up with me recently. I hope you are all having a fantastic day. And thank you so much for still being there! I recently reached 400 followers, and it is so unbelievable! Stay awesome! 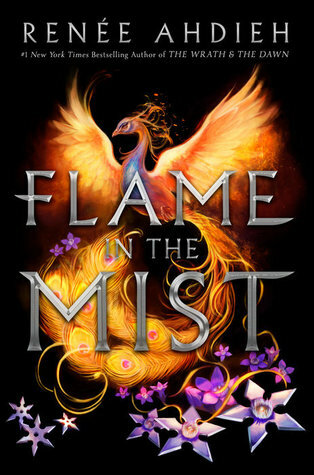 Flame in the Mist is Renee Ahdieh’s new novel. You might know her from her duology The Wrath and the Dawn which was a retelling of the Arabian Nights (review), but this time, the story is set in Japan, and follows the daughter of a samurai… And it’s just as great. Flame in the Mist follows Mariko, the 17 year old daughter of a samurai, who is attacked on her way to the capital where she was supposed to marry royalty. She fakes her own death and goes in hiding, deciding to take revenge on the Black Clan, responsible for the deaths of her people. Hiding in the forest as a boy, she finds a freedom she never had as a girl, and manages to infiltrate the Black Clan, where she soon befriends the cook and attracts the wrath – and more ? – of the clan leader’s right hand, a mysterious boy nicknamed the Wolf. Now, onto the story. I have heard this book marketted as a Mulan retelling for some reason but I did not mention it in the synopsis, because I personally think it’s wrong. Mulan is set in China, while Flame in the Mist is set in Japan (and later in time I believe). Mulan is the single daughter of an old man who is too old to fight, while Mariko has healthy parents and a twin brother more than able to fight. Mulan infiltrates the army to replace her father and defend her country, while Mariko infiltrates a gang of outlaws for completely different reasons – survival, revenge, and a need to prove herself. So really, the only thing they have in common is a girl crossdressing as a boy, and honestly, that is not enough to consider this book a retelling of Mulan in my opinion. If you go into this book looking for a retelling of Mulan, you will probably be disappointed. However, that left aside, it’s an amazing book. The second thing I wanted to address is the fact that this really gave me some Asian drama vibes which I really enjoyed. Of course, this makes sense since the story is set in Japan. But I have also watched quite a few (Korean or Japanese) dramas where the female lead is crossdressing as a male, and lives in a guys only environment (Hana Kimi, Ikemen Desu Ne…). Same with some mangas and manhwas I have read (Idol Shopping, Love in the Mask…) So I guess this rang a bit the same. And I really liked it. I think Mariko was a really interesting character. She is a rather badass girl, who tries her best but still remains human. I also really liked the other characters such as Okami, Renmaru, Ren, Yoshi… Though I didn’t really like Mariko’s brother Kenshin. The universe was really nice, and changed from what I usually read. I need more books like this, honestly. The story line especially in the second part reminded me a lot of The Wrath and the Dawn/The Rose and the Dagger in the way that the main character starts to feel empathy for those she considered her enemies and infiltrated in order to get her revenge. Just like Sharzad, she realises she might have been wrong, that there might be more to the story, and that there is another enemy somewhere else. Love gets in the way. And then she realises there is also more to her family than she expected at first. And for some reason, this kind of plot really works for me, so I loved it. I also really enjoyed the fact that we didn’t get the story only from Mariko’s point of view, but also from Kenshin’s and the Emperor, which allows the reader to know a bit more than the characters, and makes the story even more interesting. Overall, I thought that Flame in the Mist had a pretty basic plot but still a very enjoyable one, as well as some great twists. I knew something was up, but I couldn’t really piece up what, and the ending left me with so many questions. I can’t wait for the sequel! Let me know your thoughts in the comments if you have read this book as well! I don’t have a lot of bookish content to share these days, but it seems I have a lot of things to vent about, and since I consider these issues important, I wanted to share my thoughts with you all. As usual, feel free to share your opinion with me! The matter I wanted to address today is this add that keeps popping on my Facebook feed. It is promoting an app called “BetterHelp”, supposedly for people who have mental issues and don’t have time to see a therapist. It also seems to target people who can’t afford one, but considering their cheapest plan is $35 a week, I wouldn’t exactly say it’s affordable. I have a few problems with this ad, and the first one is that it keeps appearing on my Facebook feed as if it knew that I am the targetted audience and that makes me slightly uncomfortable to say the least. My second problem is the image featured on the ad – let me just mention that this is not always this one, but I wanted to talk about this one in particular. It also makes me super uncomfortable for the very reason that I am the targetted audience for this app. I don’t know. It seems really triggering and I remember that the first time I saw it, I really didn’t feel good afterwards. And finally, what really bothers me is their motto “no therapist? no problem” because it promotes the wrong idea, even if the point here is that you will get a therapist through the app. I wanted to pinpoint the fact that for some people, having no therapist is a real problem. And it’s not necessarily because they don’t want to, but can also be because they cannot afford it. And that’s a real problem. It also promotes the idea to people who don’t understand this kind of problems – that mentall illness is a real issue – it promotes the wrong idea, that having no therapist is not a problem, when it is. It gives the wrong idea that you can deal with this yourself, when sometimes, you just can’t. I think this app may be a great thing for people who don’t have time to meet a therapist regularly, or simply don’t have a good therapist nearby. And I would be glad to hear it helps some people. However, I really don’t like the way it is marketted. And I personally don’t think it is “affordable” as promoted. Basically, my point with this article was simply to once again raise awareness about mental illness, and tell you that YES, THERAPY IS GREAT though its cost may be a major problem. Don’t hesitate to talk to a doctor if you have suicidal thoughts, or if you suspect you have a mental illness. It can help to talk even if the problem is not that major. Everyone perceives things differently. Please contact a therapist if you think you need to. If you are a high school or college student, your school/university should have a therapist that you can consult for free (I know that really helped me this year). Please take care of yourself. Hi everyone! I don’t have a lot of time to read and blog these days. I had two friends visiting me in Berlin last week, and now exams are coming, I have to move out of my dorm in the midst of everything, and then I will be going back to France. So yeah, I’m a bit busy. But I still want to stay active on here. So here we go. I was tagged by Not-so-modern Girl to do the Happiness Tag, and I decided that it was a lovely thing to do. Thank you so much for tagging me! The first thing you have to do is talk about five things that make you happy. And the second one is to list five songs that make you happy. This is not exactly a bookish thing, but it sounds fun and positive, and therefore deserves it place here. 1. I’m going to start with the obvious and say reading. I just love it so much. It allows me to escape. It makes me so happy to just read, discover new books, new characters, new stories, and to dive into fiction. 2. Spending time with my friends, whether my high school friends, my college friends, or my Erasmus friends. They are all so amazing and supportive. As much as I dislike large groups of people, or meeting new people and people in general, when it comes to my friends, I love them so much, I’ll fight for them, and spending time with them overall makes me super happy. 3. Cooking. I absolutely love making cakes, cookies, pancakes and such. Bonus if I’m cooking with my friends. 5. And of course, I couldn’t make this list without mentioning blogging. I have to admit, when I started this blog almost two years ago, I never thought blogging would become such a big part of my life, but now it is. It has become really important to me. It helps me sit down and think. It’s something I really like. And yes, it makes me happy. For some reason this song makes me feel really energized and excited. It’s a good one to lift up my mood. Bonus: I’ve seen them live, and hearing their songs always brings back good memories! This one is one of the first kpop songs I ever listened to and it is so cute and beautiful, it always makes me really happy. And also brings back some memories which is always something I enjoy! And that’s it for this blog post! I’m not tagging anyone but feel free to do it as well if you want and consider yourself tagged. Feel free to share what makes you happy in the comments as well, and have a wonderful day! Hi guys! I’m super busy these days and I don’t have much time to read or blog, but here is my latest video, which I filmed before this insane week (weeks?) started! Hope you enjoy! Four colours. Four Londons. And only two people can travel between them. These people are called Antari, and Kell is one of them. An orphan from Red London, adopted by the Crown, and bound by friendship and brotherhood to the heir, Rhy. Meanwhile in Grey London, Delilah Bard dreams of becoming a pirate, and soon she is swept up by a plot bigger than herself, and discovers that she might have abilities of her own. In White London, Holland is slave to the Danes, the king and queen reigning over the realm. His powers are unlimited though, and he strives for a better world, doing anything he can to achieve his freedom, good or bad. Locked away from the other cities, Black London is supposedly dead, but a powerful artefact might be able to change everything for everyone, magical or magicless London. I absolutely love the universe that Schwab created in this series. It is so original and full of amazing twists. I feel like these books are fit for both historical fiction and fantasy lovers. I just loved everything about them. The characters are amazing, diverse, unique, and endearing. And the setting is incredible. Each book comes with new twists and adventures. And by the end of the trilogy, I really didn’t want to leave this world. Words are not enough to describe how fantastic this trilogy is. It kept me on edge from beginning to end. And I loved it. The world building is absolutely incredible. And it is so well written. I liked each book even more than the previous one. The characters are all so different and incredible. They are all complex, and cleverly written. It’s impossible to pick a favourite. Every volume managed to bring its lot of surprises and new amazing characters and twists. Amazing doesn’t even begin to sum it up. I really liked Kell, obviously. He has powers that none can understand, but he also has his own wounds, and faults. He feels to human and relatable. He is fierce and needs to be protected. And then there’s Lila of course. From thief to pirate, this girl has done everything. She can lie as well as she can breathe. She is immensely strong, morally and physically. She also has her faults, and for that, I will always admire her. She is the amazing person I wish I could be. Then there’s Rhy, the prince, who struggles with his magic and wants to be stronger. At any cost apparently, and it does definitely cost him. But he also knows how to value his mistakes, and the people he cares for. What I like the most about him is his gift for languages, because it’s always something I admire. Holland, the other Antari, appears at first to be a villain sort of character, but the more we read, the more we learn. And he is so much more than that. He is a very complex character, who was built on pain. It is so interesting to read about him. Even if he’s really not my favourite, I sometimes couldn’t help but feel bad for him. And one more character I wanted to mention, of course, is Alucard, though he is only introduced in the second book. He is another very complex characters, and mysterious as well. A powerful magician, though not an Antari. A pirate and a noble man, with an undying love for the heir to the throne. Everything about these books and these characters is amazing. The romances are well played, and don’t overshadow the plot itself. Shades of Magic is a tale of magic, obviously, of adventure, and of power games. It has a bit of everything, and what else can I say, it’s fantastic! I honestly don’t know what else to say about these books. I really loved them, as you probably got by now, and I felt that they deserved their place on my blog so here we go. Have you read them? If so what did you think? I read book one and three on kindle, and listened to the audiobook for book two, which was also an amazing experience. I’m actually considering getting the physical copies because they are so gorgeous, both the American and the British edition! Victoria Schwab is amazing, and I want to read more of her books. Which are your favourites? I also read Vicious which was incredible, and the next on my list is This Savage Song!